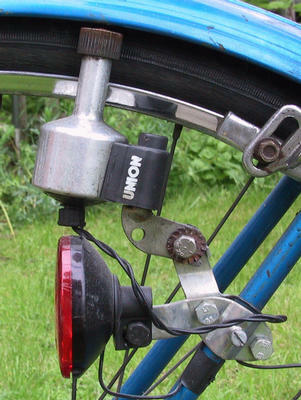 Feasibility of an eddy current difficulty brake on a tricycle. I'm a biomedical engineering student in Canada, and I'm working with a doctor to develop a training tricycle for children with cerebral palsy. One of the issues we'd like to solve is that since the tricycles are not geared, some children are simply too good at pedalling on flat surfaces and don't get the necessary muscular workout in their legs from pedalling. We'd like to add some sort of difficulty setting to the rear wheels of the tricycle (the front wheel is occupied by a locking mechanism we designed) to make pedalling a little more challenging for some kids. I considered using a friction system but the idea of adjusting tension in two breaks simultaneously and the frequent pad replacements doesn't appeal to me. I recently thought of using eddy currents to slow the rear wheels. This would be extremely convenient because we could control the eddy currents in function of the child's strength to give them each a personalised workout. Do you think it's feasible to use eddy currents to adjust the difficulty of pedalling a tricycle by slowing the rear wheels? Could an electromagnetic system be used with a sufficiently large battery to allow a child to ride throughout a day? Would a system with swapable permanent magnets be more efficient (similar to a power tool)? Would an eddy brake system produce excessive heat that could in turn harm the child? Thank you for all your help as I'm not an electrical engineer. Those old bicycle generators were made for headlights. but they sure slowed a bike down a lot.It could be fun for kids to see light from their exertions. a train of wagons would be a cool thing for a kid to tow around. Hey, uh, you said you're (they're) driving these trikes around on a flat surface, right? Would it be cheating to just build a thing, like a trailer, but with a flat bottom rather than wheels, like a sled, a trailer-sled, to be dragged behind the tricycle. You could increase the amount of resistance offered by the sled, sliding on the flat ground, just by piling more weight into the sled, like bags of sand, or something like that. As images of tractor pulls cross my mind https://www.youtube.com/watch?v=gpi9_gphJlo. Rolling coal. I like the sled concept. Visual feedback of progress and competition toward a goal aka, a game. Hey, thanks for linking to that. I have heard of tractor pull events, but I've never actually seen one in real life, and maybe I've never seen one on Youtube either, until now. I also like this sled concept, mostly because it is mechanically simple, but as you point out, it maybe has some good psychology to it too. This is actually the first thing that went through my mind http://cleancutcreations.com/vintage-collectable-restorations/1955-murray-tractor-2/?afg121_page_id=2#afg-121. visit a gym. Look at eddy current brakes on exercise bikes. A centrifugal brake may work better for you. While this may be more then you want, this is the lightest eddy brake I know of.. It works with two or four coil wound adjustable electro magnets that are Stationary... Magnetic flux is directed through the rotating aluminum disk, creating eddy current drag, to the iron back plate also rotating. I would gear up to increase RPM for any electro machine load or find a suitable low speed PM motor which can be a generator for drag..
Click the pic to see all of the image.. I forgot there is air dynamic braking, like the speed governor on a music box using the back pressure of air to create a load. is made for generating electricity from a spinning bicycle tire. The shaft on one of these bottle dynamos (BDs) actually turns pretty fast, at an angular speed approximately the ground speed of the bicycle divided by the radius of that tiny little wheel on the dynamo. Moreover, the BD might be easy to mount to a tricycle's rear wheel. I mean you have to mechanically connect to the tricycle's wheels somehow. Either that or add another wheel that rides on the ground, but then technically it would have more than three wheels, and it would not be a tri-cycle anymore. Not sure how much resistance torque you'll get from a typical BD with its output completely shorted, like with a piece of copper wire. However much that is, that is essentially the maximum mechanical resistance you could get from one of them. Anyway, that might be something to try, especially if you already have a bottle dynamo in your junk collection, or parts box. Put an alternator on the wheel, and generate into an external transistor on a nice fat heatsink. Adjust the load by driving the transistor as needed. Do you have a particular alternator in mind? I mean one that would be well matched to the speed tricycle wheels turn, without having to gear those up too much. I think the slowest motor-generator I have encountered in the wild, is the mechanism in those dancing solar flower toys, or maybe the 2-step stepper motor in a cheap quartz clock. Of course those are not made to handle significant amounts of power. is kind of a typical example of this. Any permanent magnet DC motor can be used as a machine to transform electrical load into mechanical load. As a simple demonstration of this, all you need is a small PMDC motor, and a clip lead. The motor's shaft will turn easily when its terminals have nothing, an open circuit, connected across them. Connect the clip lead, a short, across the terminals, and suddenly the motor shaft is much more difficult to turn. This is a difference you can feel with your fingers. Then you can connect whatever load you want, across the motor's terminals. I am guessing this would be different sized resistors, or possibly a power wasting circuit of some kind. Like Steveastrouk suggests, a big transistor with a heat sink, might serve as the part of that circuit, that actually dissipates the power. Regarding batteries, this system should not need batteries, as there is plenty of power available from the child driving the tricycle. The problem is getting rid of that power somehow. By the way, what I am describing here is essentially the same thing Steveastrouk suggests, "Put an alternator on the wheel, and generate into an external transistor on a nice fat heatsink." The only thing new I am telling you is that a PMDC motor will work too. Moreover it will help a lot if the motor you do choose is one designed to turn slowly, so that not a lot of gear train is needed between the motor-generator and the slow turning tricycle wheels. The thing is, I am not sure if slow-turning PM motors (or alternators) are easy to find. It might be the case that fast-turning PMDC motor, plus a sturdy speed reducing gear train can be found, for less cost than the slow moving motor. I don't know if that is actually true, but it does seem to be the path the cordless power tool manufacturers have followed. All their stuff uses fast-turning PMDC motor, plus a gear train to slow down (and torque up) the power going to the output shaft. Well first of all it is called "Dynamic Breaking". This will help you when you search for different designs. And yes permanent magnets will work. You should be able to control the drag by increasing or decreasing the the power to the magnetic field. Built right it should never get hot. I would just add a solid axle and use a little disk brake as used on bike and small motorcycles. Costs only a few bucks and the pads last a long time in this sort of application. If you want to use current to slow the wheels then you also need voltage - where exactly is it coming from?